I've written about my backwards approach to to projectile motion previously here, here, and here. A student is at one end of a basketball court. He wants to throw a basketball into the hoop at the opposite end. What information do you need to model this situation using the Geogebra model? Write down [______] = on your paper for any values you need to know to solve it using the model, and Mr. Weinberg will give you any information he has. Find a possible model in Geogebra that works for solving this problem. At what minimum speed he could throw the ball in order to get the ball into the hoop? The students did what they usually do with the Geogebra projectile motion model and solved it with some interesting methods. One student lowered the hoop to the floor. Another started with a 45 degree angle, and then increased the speed successively until the ball made it into the hoop. Good stuff. A student's comment about making lots of guesses here got me thinking about finding solutions more algorithmically. I've been looking for new ways to play around with genetic algorithms and Monte Carlo methods since they are essentially guess and check procedures made productive by the power of the computer. Get information about the initial characteristics of the projectile and the desired final location. Make a large number of projectiles (guesses) with random values for angle and initial speed within a specified range. Calculate the ending position of all of the projectiles. Sort them by how far they end up compared to the desired target. Take the twenty projectiles with the least error, and use these values to define the initial values for a new, large number of projectiles. Repeat until the error doesn't change much between runs. Report the projectile at the end with the least error. Report the entire procedure a number of times to see how consistent the 'best' answer is. I've posted the code for this here at Github. This is also on a live Desmos page here. This shows that there is a range of possible answers, which is something I told my physics class based on their own solutions to the problem. Having a way to show (rather than tell) is always the better option. If you haven't yet participated, visit http://apps.evanweinberg.org/halffull/ and see what it's all about. If I've ever written a post that has a spoiler, it's this one. 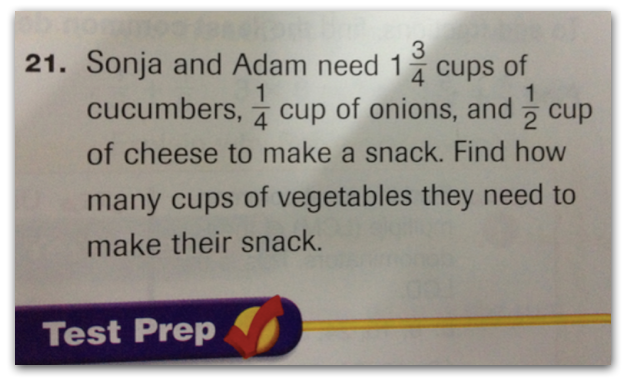 "A great application of fractions is in cooking." At a presentation I gave a few months ago, I polled the group for applications of fractions. 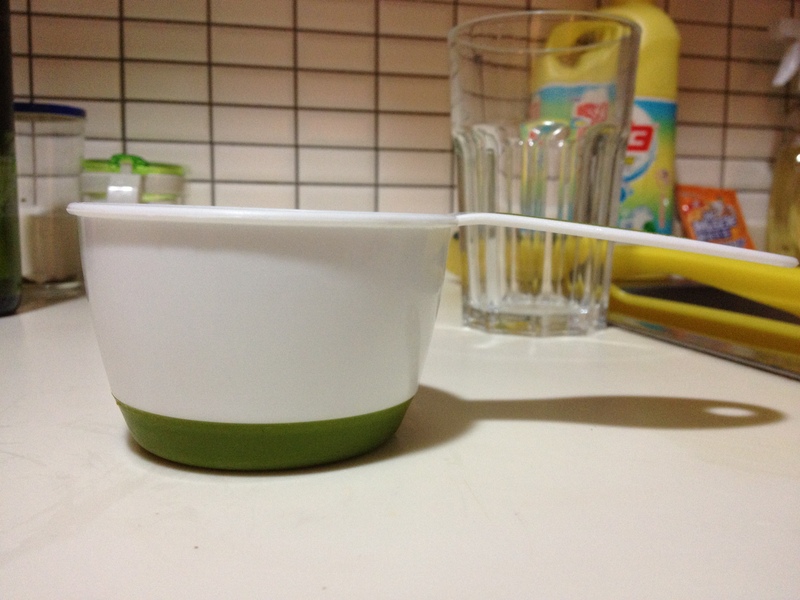 As I expected, cooking came up. I had coyly included this on the next slide because I knew it would be mentioned, and because I wanted the opportunity to call BS. A recipe calls for half of a cup of flour, but you only have a 1 cup measure, and to be annoying, let's say a 1/4 cup as well. Is it likely that a person will actually fill up two 1/4 cups with flour to measure it out exactly? It's certainly possible. I would bet that in an effort to save time (and avoid the stress that is common to having to recall math from grade school) most people would just fill up the measuring cup halfway. This is a triumph of one's intuition to the benefits associated with using a more mathematical methods. In all likelihood, the recipe will turn out just fine. As I argued in a previous post, this is why most people say they haven't needed the math they learned in school in the real world. Intuition and experience serve much better (in their eyes) than the tools they learned to use. My counterargument is that while relying on human intuition might be easy, intuition can also be wrong. The mathematical tools help provide answers in situations where that intuition might be off and allows the error of intuition to be quantified. The first step is showing how close one's intuition is to the correct answer, and how a large group of people might share that incorrect intuition. Thus, the idea for half full was born. With the exception of the trapezoid, the mean is right on the money. Seems to be a good example of wisdom of the crowd in action. As expected, people were pretty good at estimating the middle of a rectangle. The consistency (standard deviation) was about the same between the rectangle and the trapezoid, though most people pegged the half-way mark lower than it actually was on the trapezoid. This variation increased with the parabola. Some people clicked through all four without changing anything, thus the group of white lines close to the left end in each set of results. Slackers. 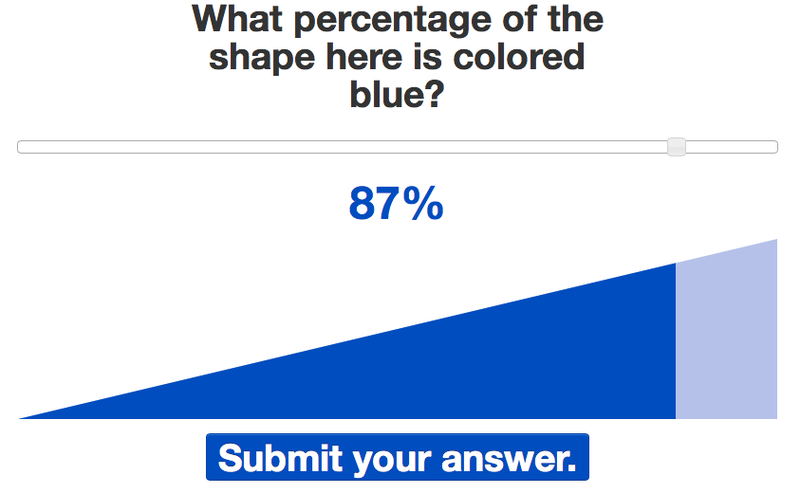 Some people clearly went to the pages with the percentage shown, found the correct location, and then resubmitted their answers. I know this both because I have seen the raw data and know the answers, and because there is a peak in the trapezoid results where a calculation error incorrectly read '50%'. I find this simultaneously hilarious, adorable, and enlightening as to the engagement level of the activity. In a cooking context, being off doesn't matter that much with an experienced cook, who is able to get everything to balance out in the end. My grandmother rarely used any measuring tools, much to the dismay of anyone trying to learn a recipe from her purely from observing her in the kitchen. The variation inherent in doing this might be what it means to cook with love. My dad mentioned the idea of providing a score and a scoreboard for each person participating. I like the idea, and thought about it before making this public, but decided not to do so for two reasons. One, I was excited about this and wanted to get it out. Two, I knew there would probably be some gaming the system based on resubmitting answers. This could have been prevented through programming, but again, it wasn't my priority. Jared (@jaredcosulich) suggested showing the percentage before submitting and moving on to the next shape. This would be cool, and might be something I can change in a later revision. I wanted to get all four numbers submitted for each user before showing how close that user was in each case. Anyone who wants to do further analysis can check out the raw data in the link below. Something to think about : The first 550 entries or so were from my announcement on Twitter. At that point, I also let the cat out of the bag on Facebook. It would be interesting to see if there are any data differences between what is likely a math teacher community (Twitter) and a more general population. This activity (along with the Do You Know Blue) along with the amazing work that Dave Major has done, suggests a three act structure that builds on Dan Meyer's original three act sequence. It starts with the same basic premise of Act 1 - a simple, engaging, and non-threatening activity that gets students to make a guess. The new part (1B?) is a phase that allows the student to play with that guess and get feedback on how it relates to the system/situation/problem. The student can get some intuition on the problem or situation by playing with it (a la color swatches in Do You Know Blue or the second part of Half Full). This act is also inherently social in that students easily share and see the work of other students real time. Now that the students are invested (if the task is sufficiently engaging) and have some intuition (without the formalism and abstraction baggage that comes with mathematical tools in school), this problem has a bit more meaning. It's like a second Act 1 but contained within the original problem. It allows for a drier or more abstract original problem with the intuition and experience acting as a scaffold to help the student along. This deserves a separate post to really figure out how this might work. It's clear that this is a strength of the digital medium that cannot be efficiently done without technology. I also realize that I haven't talked at all about that final page in my activity and the data - that will come later. A big thank you to Dan Meyer for his notes in helping improve the UI and UX for the whole activity, and to Dave Major for his experience and advice in translating Dan's suggestions into code. The histograms were all made using plot.ly. If you haven't played around with this yet, you need to do so right away. Raw Data for the results presented can be found at this Google Spreadsheet. Server side stuff done using the Bottle Framework. I learned a lot of the mechanics of getting data through JSONP from Chapter 6 of Head First HTML5 Programming. If you want to learn how to make this type of tool for yourself, I really like the style of the Head First series. Hosting for the app is through WebFaction. Code for the activity can be found here at Github.